Aaaaand Now - Ramblings of Mad Shutterbug & the Border Collie Bros.
Today we get a connection, after a brief bit of bollocksville. On Saturday, I moved and cleaned out one of three igloo-shaped dog houses we own. I moved the one Houdini mostly hasn't been using (as Indoor Dog, he hasn't been spending much time outdoors except in the company of his Humans) since it is actually the cleanest of the three just now. After a couple weeks of nearly continuous rain, both Smudge and Squrrl need some house-cleaning done. Smudge specifically; I'd noticed he wasn't as active as usual, put it down to the rain, then paused one evening while feeding him. Leaned in closer and listened to his breathing, and heard... crackles. Checked him out a bit more intensely to find pale gums and tongue as well. And, he didn't eat as much as usual either. Now, following some antibiotics, and some of Herself's patented Rice & LiverBits (liver bits supplied by a couple of the Ranch stock), plus a clean house located closer to the current batch of Dirty Yard Birds (chickens), and Smudge both looks and sounds better. So the bit of sand in this photo came out of Houdini's house. About 45 x 30 cm in size, dumped out in the afternoon on Saturday. Sunday morning walking out to feed teh Ranch stock, I stopped before stepping into the sand patch because... well, go look at the photo. Unless you are an ant (aunts are fine, not ants). You might not want to look if you're an ant. Oh no, feel better soon Smudge! Feelin' better. Summer cold is all. I <3 ant lions. They are so cool. They are! 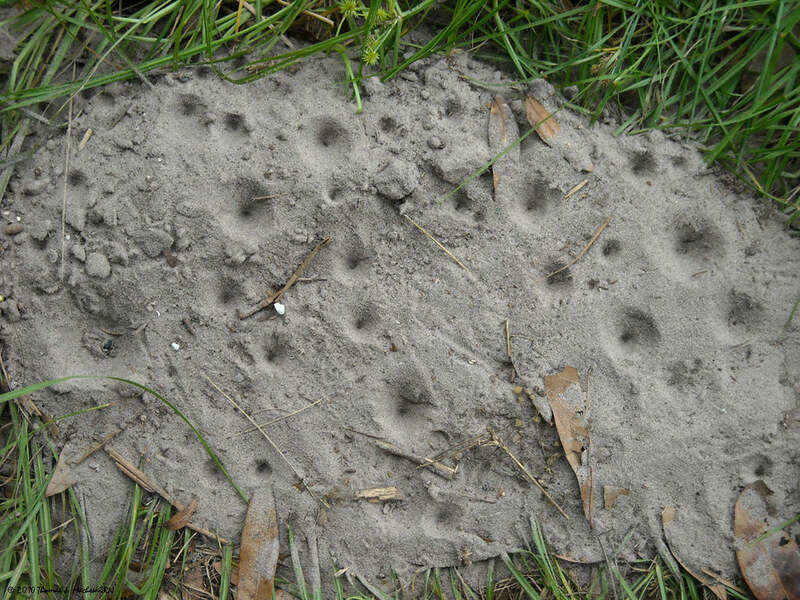 Unfortunately for Antlionville, I'd dumped the sand in the middle of the driveway... and ant lions are hard to 'transplant'. However, there are still a lot of them out there.